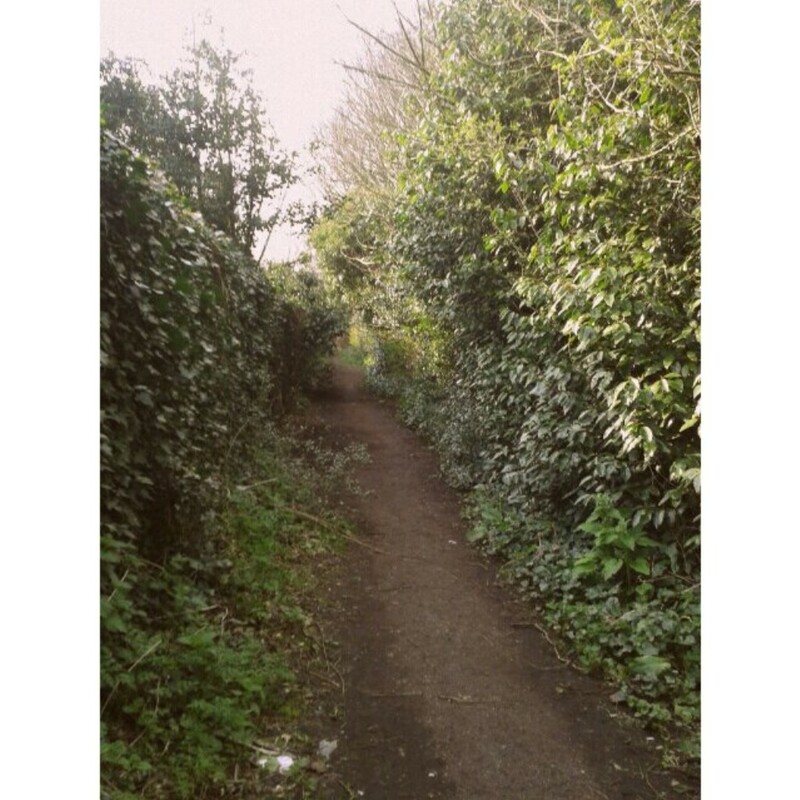 My first picture this week was of this lovely little path I walk down to get from college to the bus stop. I used to walk this way every day last Summer, but once Winter came along and the weather got wetter, it didn't seem like such a good option - slipping over in the mud isn't the ideal start to a full day at college. But, since the weather has been much brighter and drier lately, and since I had a little extra time to get to the stop, I thought I'd take a little wander down my favourite pathway again. I really do think it's important to spend time in nature whenever you can, even if it is just a little walkway hidden away in the middle of a city. I find it really grounding and refreshing, and it's a good opportunity to slow down for a moment and breathe in the life that surrounds you. I took this picture on the same day, when I arrived early to one of my classes and decided to nip down to Starbucks and grab a soy cappuccino and spend some time reading before the lesson started. 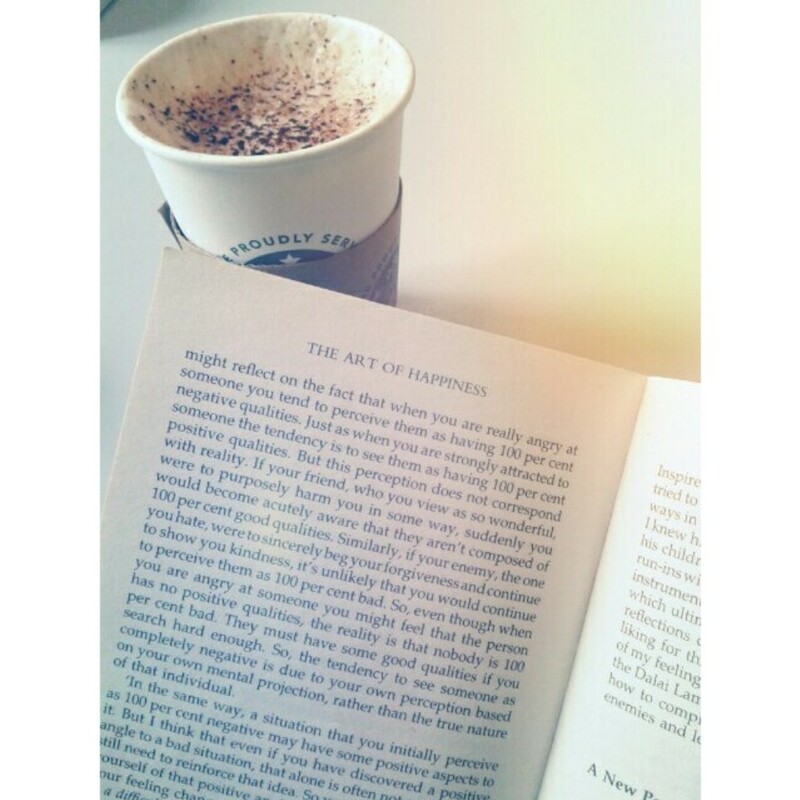 Like I mentioned last week, I started reading 'The Art of Happiness' again, and I'm over half way through now. This book really resonates with me and I'm really working on incorporating every lesson/practice/thought pattern in it into my life, and so far it's going well - I feel lighter, more confident, less stressed and generally happier, which is nothing to shake a stick at. I took this picture on Friday night when the boy and I headed down to one of our favourite places, The Bicycle Shop, to celebrate his birthday. The Bicycle Shop is a wonderful café/restaurant/bar in the artsy end of Norwich which serves breakfasts, lunches, dinners and drinks, and sometimes local or new artists perform gigs there. 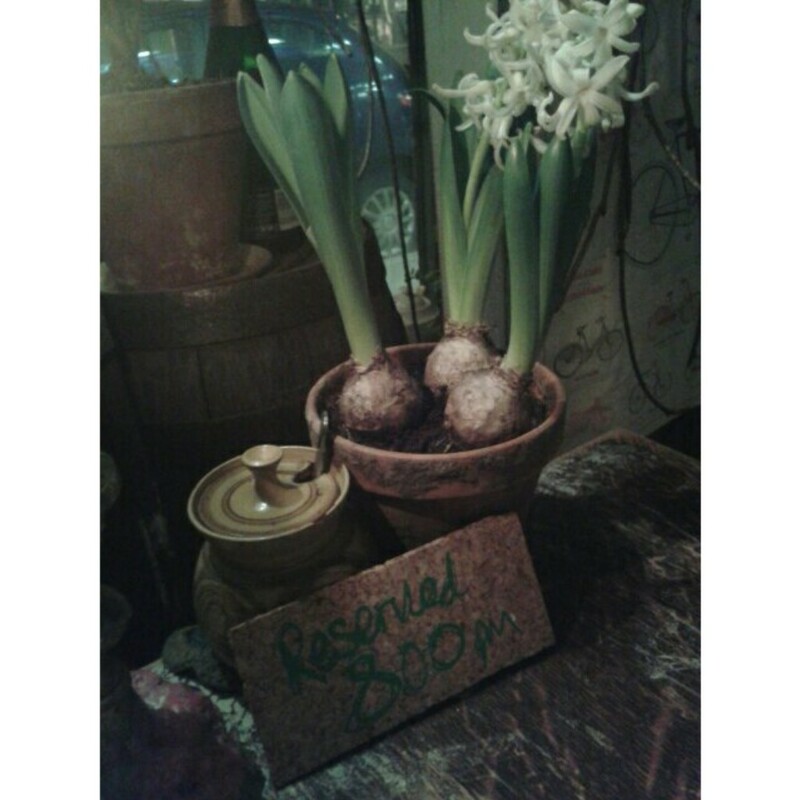 The Bicycle Shop is filled with plants and lots of little vintage-y knick-knacks as well as lots of candles and old books, and all of this makes it feel more like someone's home than a restaurant. Until Friday I'd only ever been on the first and second floors and I thought that was all there was, but when we asked for a table we were told that one would be ready in about 10 minutes and that if we wanted to we could wait in the bar downstairs until then. So, we ventured down and found a thriving bar with a candle-lit patio area outside. If you're ever in Norwich and you like homely or unique places, I would really recommend paying a visit here - there's good, fresh food (the falafel dish is my favourite so far) at all times of the day, tea, coffee and drinks, so it's a great place to go whether you're looking for brunch, lunch, a space to relax with some coffee and a book, an evening meal or somewhere to go for a few drinks in the evening. The staff are always super friendly and welcoming and the atmosphere is like no other, and the prices aren't bad either. The rest of the week was very laid back - Saturday was a fairly lazy day and on Sunday I did a bit of coursework and blogging and of course, spent time with my Mum for Mother's Day. We never really do much on Mother's Day but we always spend some time together in the morning and the evening and if we don't eat out or order in I'll make a nice meal; this year we went for this pad thai dish - it had been a lovely spring day (it was even warm enough to open the windows!) and pad thai seemed like the ideal meal to round the day off with what with it being so light, fresh and zesty. I hope you've had a lovely week!